Arlene, a local hiker, asked me about the stone walls at Ed Levin County Park. She said she’s been to the park but hasn’t seen the walls. Perhaps she’s among the sane folks who avoid hiking to the heights behind Ed Levin’s Sandy Wool Lake — the summits require 2,000 feet of climb in 3.9 miles, most of it unshaded and wind-blasted. The insane, like yours truly, have enjoyed the benefits of gazing upon these these interesting piles of stone. Here’s a picture from a few years back. To reach the walls you have to hike to the Monument Peak summit, about a quarter mile from the intersection of the Monument Peak and Agua Caliente trails. Either trail is a major slog, but the Monument Peak Trail is a little bit easier. I found them a few years back when a couple hikers asked me if I knew anything about rock walls at the Monument Peak summit. At first I had no idea what they were talking about, then I remembered the piles of stone queued up across the country side and figured that’s what they were looking for. Somebody told them the rocks might’ve been from the pre-Ohlone period (Ohlone were the indigenous people who were run off by the European settlers of California). Santa Clara County’s brochure for the park says some of the stone walls may have been built by an Amish settler around the turn of the 20th century, but others are a mystery. If you’re thinking of heading up to take a look at them, they’re pretty easy to find. There’s a huge radio tower near the summit with an old gravel road behind it. When you get to the Monument Peak-Agua Caliente trail junction, bear right on the old road behind the tower (a sign says “keep out” but nobody does; just behave yourself) and stay on it till you get to a flat spot that has some flat concrete areas that used to hold towers. This is the Monument Peak summit. The rock walls continue southward down the hillside. This is a pretty mean hike in the summer, but not so bad in the winter or during spring wildflower season. Hiking to Mission Peak from Ed Levin (lots o’ GPS data here). Where I live, stone walls like this are common. Not all, or even most of them, were built by the Amish. They are common in southern Pennsylvania and any place in the mid-Atlantic region or interior New England where rocks are more prevalent than soil. My area is a very rocky region, and clearing the land for cultivation was a back-breaking process. The rocks were gathered and removed to the edges of the fields or roads. No one wanted to carry the rocks very far, so fences or walls were built at the edges of the newly cleared land. Much of the clearing took place after the Revolution but before the Civil War. Another place to see lots of stone walls is at Gettysburg, PA, on the battlefield. But the fences are all over. Sometimes I even find one in the middle of a woods. These are usually old property lines. Even today I pass miles of them every day. Some are still used, many are just remnants of the past. Your wall could have been built by any farmer from the time period, though it was likely an eastern farmer from the mid-Atlantic region where these walls are common. I considered it highly unlikely that any indigenous peoples would have built the walls — and much more likely that a cattle rancher cleared them to avoid injury to animals grazing on the steep terrain. Thanks Tom. My friends & I will look for the rock wall this Fall or Winter. Tom, how’s the trail? I’m a fan of old stone walls, even though they’re most likely only late 19 th – early 20th century rancher. 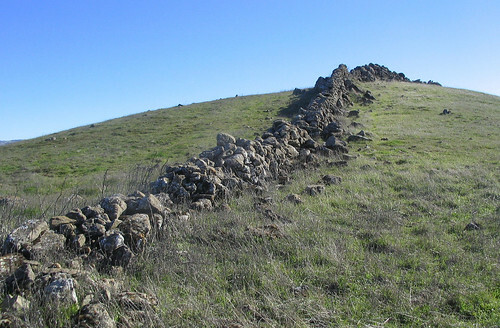 The Ohlone were not wall builders, nor were any Nor Cal indigenous tribes. They just didn’t settle in one place long enough to build permanent structures. But it would be cool to see them. If it’s Mission Peak steep, that’d be OK…even steeper. I’ll pull a map of Levin and check the hike on a topo. Bob: there are roads but they’re frequented by large SUVs taking hang gliders to the top. There’s also a bunch of cattle gates that must be opened. And remember: 8 miles in the direct sun. Half downhill, but still. I could probably guide you to the top if you insisted, but it’d be a major, major haul. Joesph Chartkoff, “A Rock Feature Complex from Northwestern California,” American Antiquity, Oct. 1983. No one knows if the Ohlone engaged in similar practices in the Bay Area’s “high country.” And no one knows that they did not, contrary to comments above. The rock walls in question do not enclose cleared fields, so they are not the work of farmers, and cattle have no trouble grazing in and around the rock outcrops and boulder-strewn hillsides that border the rock walls. Ohlone lived in permanent or seasonal villages within relatively small triblet territories, contrary to the impression conveyed by Bob Coomber, above. Many such villages were located adjacent to the shellmounds that were once prominent features of the bay’s geography. The walls run from Tilden Park in Berkeley all the way down to San Jose along the ridges east of the Bay, over 40 miles. They clearly are not the work of white settlers, as many run in serpentine patterns, end in the middle of nowhere, or go up steep bluffs. They are very similar to walls found in most of New England, along with stone chambers, cairns, effigy stones and stone circles. IMO they are very old and the work of early Indian tribes, or perhaps the precursors to the current indigenous tribes, and they had religious/spiritual significance. It is interesting that the East Bay Walls are said by the local Indians (Micwocs) to have been there when they arrived. Some believe they may even be the work of prehistoric Caucasians who settled the area 2000 years ago or more. FWIW, the walls on Monument Peak can be seen on Google Maps or Bing Maps. Fascinating! Thank you for the photo. Many walls elsewhere in the bay area (i.e. Marin, Mission Peak area, etc.) coincide with mexican land grant boundaries labeled on USGS quadrangle maps. I’m guessing most of the straight wide low walls are monuments to property boundaries dating back to times when surveyors weren’t that good or honest. The hills were not farmed and the walls didn’t control cows or make them safer. I really appreciated this web page. I saw these up in the hills a couple weeks ago … I found these walls to be very mysterious. This was the only substantial information I could find about it.